Purlins are dimensional lumber that are fastened to the top chord of trusses connecting them together for bracing purposes. The purlin are ultimately used to fasten the roof steel providing a diaphragm effect, along with the siding, when properly engineered and installed. Spacing is typically 24″ on center in low snow loads and is reduced based upon truss span and snow load. There are three typical methods used to fasten purlins to the top chord of trusses. In the order shown above, purlins laying flat ( use 2 20D ring shank nails per connection) for trusses with minimal spacing, hung purlins for wide span trusses (LU26 hangers for 2×6, LU28 hangers for 2×8 etc), and purlins on edge (overlapped not butted) for mid range to wide span trusses (8′ or 9′ spacings), installed with 1 60D galvanized ring shank nail. The most common method employed is laying the purlin flat (typically a 2×4) and nailing to the truss with two 20D galvanized ring shank nails. This method is used for trusses designed to be closer together, from 2′ on center up to a maximum of 5′ on center. We suggest 5′ on center trusses with flat purlins to be restricted to 30# ground snow loads or less in most instances. The higher the snow load the closer the purlin spacing required. Too high a snow load means the purlins fail regardless of how close together you put them because a 2×4 or 2×6 flat can only span a certain distance between trusses as snow loads increase. The common 4′ on center design is suitable for snow loads up to 60# for most applications. Higher snow loads and larger spans will require purlins to be spaced closer together than 24″ on center in the drift area. Engineers calculate this on a job site basis. For snow loads exceeding 60# trusses are recommended to be closer together. A 3′ on center truss spacing for 9′ on center post spacings will handle most snow loads. 2′ on center trusses with 8′ on center posts are even stronger designs. With a 2′ on center truss spacing 7/16″ osb or plywood sheathing can be used to strengthen the structure (replacing purlins), provide excellent sound deadening when it rains or hails, and simplifies walking around on the roof, especially higher pitched roofs. 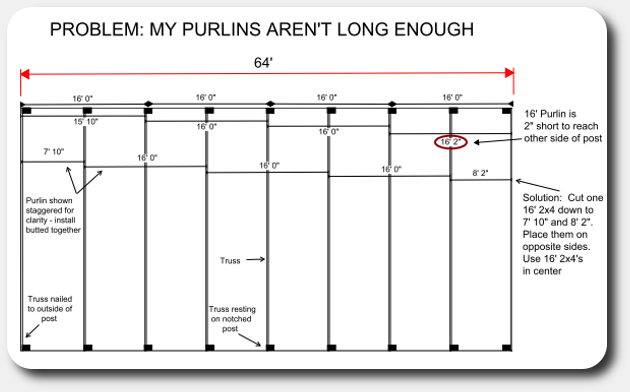 If you build a 64′ long building with no overhang then four 16′ purlins are the exact length needed to make a purlin run. However, when you actually lay them out things change a little but on you due to the fact that the gable trusses are nailed to the exterior of the posts, while the commons are notched into the post for full bearing in between. The way this works out you end up short a couple of inches (depending on the post width you use) at the end, scratching your head wondering what to do. The solution is simple enough. Simply cut a 16′ length to fit the first 8′ span, say with a 6×6 you would cut it down to 7′ 10″. Then run 16′ lengths from truss to truss until you get to the other end. The 8′ + end will line up with the other side of the 16′ length you cut to start the run, in this case 8′ 2″ long. Staggering purlin row splice locations by halving the dimensional lumber on every other row is good practice. So for a 16′ 2×4 purlin you would cut one of the 16’ers in half every other row. When laying the purlins flat should the seams be staggered or can all the seems lay on the same truss? We left that out of the post so thank you for pointing that out. its a good idea to alternate slice locations by halving the dimensional lumber every other row. Can wood purlins break (as in the end of the board, not break as in failure) on center of a roof truss. Either if they are on edge or flat, so you can have a seamless row. I see them usually overlapped. If you have to overlap how do you keep your metal fasteners in a straight line for the metal roof. Roof purlins are overlapped when placed on edge. The fasteners will not be in a straight line if overlapped. If you need the trusses on edge and want the fasteners to line up then hang the purlins between the trusses. When nailing the first truss to outside poles,how do you make sure all other trusses will be the same height as the first? The post spacing on the ends are inset by 1 1/2″ so the total building width and length will work out after nailing the skirt board, girts, and truss supports to the outside of the posts. So the truss support extends past the post and the end truss sits on it just like all the other trusses. We want to hear from you! If you have questions or need a custom design, get in touch with us at anytime – we’ll write back.